I need these to keep the air conditioning getting to a back bedroom (for some reason that room gets too cold while the rest of the house is fine. This will be perfect for my vents. My basement is extra cold in the summer and I have to close the vents to keep it comfortable. These magnetic covers will help facilitate this problem. Have shared registers but the output is not "shared" equally. This way I can block off the register that tends to get the majority of the output. To block heat vents when airconditioner is on. have a vent that I would like to cover. They look easy to use. To reduce fuel bill on rooms not using. 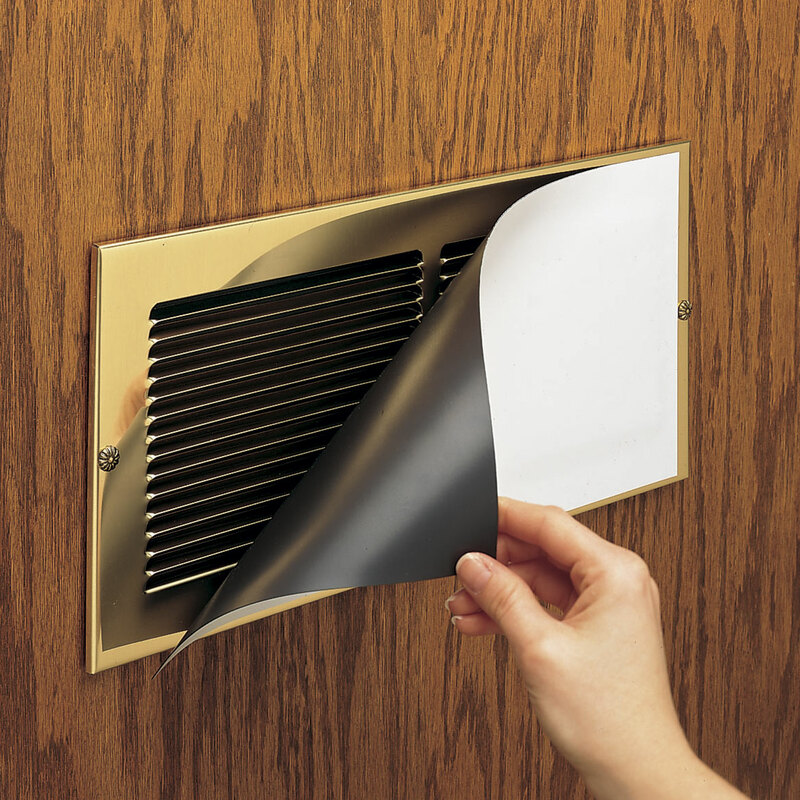 To cover one particular vent. This is great idea. It will work for rooms that you don't use that much. Why heat/air condition rooms that you don't use? My first time ordering this plus would like to try it for a vent that's over my head in the living room. Seals off register better than closing. We have a two story home and rarely use the lower floor so it would make sense to cover the vents when using the heat or air conditioning. For the basement vents to close off the heat! To protect furniture and plants from drafts. It solves a serious problem in my office. BEST ANSWER: Thank you for your question. 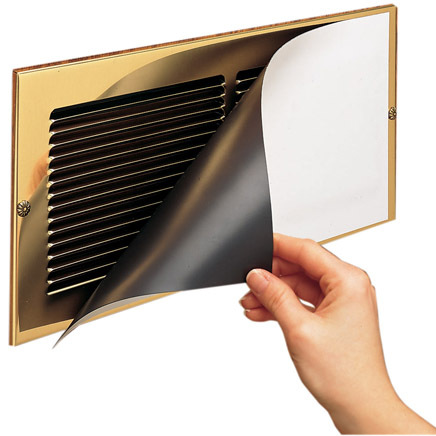 The Magnetic Vent Covers only come in one color, but can be painted to match the color you need. We hope this information will be of help to you. can you buy this in sheets and cut to fit ? BEST ANSWER: Thank you for your question. We do not sell this item in sheets however it can be cut to fit. We hope this information will be of help to you. How thick are these magnets? but I just taped down two ends over the vent and it still works just fine. of these vent covers, I'd say about 1/16 of an inch. LESS THAN 1/16 OF AN INCH THICK, MADE OF RUBBER, AND EASILY CUT WITH A PAIR OF SCISSORS. USED THEM TO SEAL OFF MY ENTIRE 2ND FLOOR OF HOUSE FOR THE WINTER. COVERED EVERY HOT AIR REGISTER AND COLD AIR RETURN. SAVED ME HUNDREDS OF DOLLARS IN HEATING COSTS DURING THE WINTER. These work fine but these aren't as think and ones I had gotton in the past. And at times I have to adjust then. And also mine are in the floor and if in a wall they should work even better !! they are not very thick, less than 1/4 inch. You can cut them to size with a scissors. They work very well to keep heat out of my room, which is why I bought them. They were pretty thick and very substantial. I use one on the vent by my recliner so it doesn't get quite so cold when the AC is on. I would recommend them. Very thin if blower is strong the magnets will not hold. About 1/2 inch. They hold well and work great! do these work on plastic? BEST ANSWER: Thank you for your question. The vent will need to be metal for the covers to work. We hope this information will be of help to you. I would not think so, they have to be magnetic which plastic is not. We have metal vents and they work great. I doubt it ... they didn't work on metal! My air system blew them right off unfortunately ?? No, they don't even work on metal!! Magnets aren't strong enough. I do NOT recommend them. Probably not. They work just like any other magnet. Will these work on foundation vents? BEST ANSWER: Yes in my case it is very helpful. I have in my office vent under my head , some days very cold. My vent from iron because they are sticky. But I try to use in different place where vent plastic? it is not work. Yes, that is where they are being used since the time of purchase, 2014. Seems to be working well. if "face" of vent is made of metal, and the face is flush, it should work. I would think so since there magnetic. Work great on inside vents. How thick are these magnetic covers? BEST ANSWER: they are very thin but stay in place. the print catalog lists this is a set of three. is this a set of three, or just one? BEST ANSWER: Thank you for your question. This includes a set of 3. We hope this information will be of help to you.